The Motorola SLR 5700 repeater is the core of most MotoTrbo repeater systems. 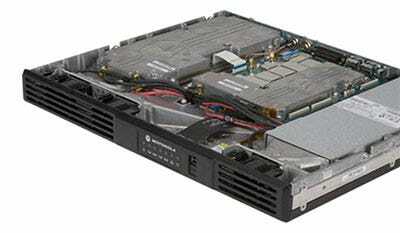 The repeater is rack mountable and offers 50 watts of output power. The Motorola SLR 5700 Repeater represents a huge leap forward in design and technology. Based on a wealth of field experience, customer feedback and technological innovation, the product delivers outstanding performance and efficiency for your business two-way radio system. From rock-solid reliability to clever touches like an integrated battery charger, the SLR 5700 repeater is truly the next generation in repeaters. Motorola is committed to supporting you with even more sophisticated workforce communication solutions as your needs evolve, so the SLR 5700 repeater is designed with the future in mind. Compared to first generation repeaters, it has 10x more processing power, 15x more memory and 125x more data storage. The architecture even has provision for expansion modules, should more functionality be required in the future. The SLR 5700 is also designed for better service with replacement modules should there ever be an issue there is no need to replace the entire unit. The system also has a self test program to get you up and running quickly after service is performed. Whether you need the simplicity of a single site conventional system, or the powerful trunking capabilities of Capacity Plus, Linked Capacity Plus or Connect Plus, the SLR 5000 Series delivers the power of digital two-way radio to your workforce. It can also operate as an analog repeater, or as a mixed mode analog/digital repeater while you transition away from a legacy analog system. The SLR 5700 repeater supports the full MOTOTRBO feature set, and is compatible with all the MOTOTRBO system architectures: single site conventional, IP Site Connect, Capacity Plus, Linked Capacity Plus and Connect Plus. The IP interface allows you to build applications and consoles directly into your system. The SLR 5700 repeater is designed to offer round-the-clock reliable operation, even at its continuous full transmit power of 50W. The high-quality design has been validated through Motorola’s Accelerated Life Testing (ALT) program, and meets stringent quality criteria. To deliver reliable coverage throughout your business premises, the product has a next-generation receiver design, with high sensitivity and improved noise blocking. Combined with the 50W transmit output power and digital error correction, this gives you clear voice quality, even in the most adverse conditions.